Home / beinspired / industrynews / news / video / OFFICIAL CD: Bishop T.D Jakes: Your Time Is Now! OFFICIAL CD: Bishop T.D Jakes: Your Time Is Now! Every time you face an obstacle, you can choose to see it simply as opposition or you can see the potential, the heavenly purpose hidden behind it. Your greatest moment may be in the mess you are up against. Are you ready to lay hold of the opportunity? Your time is NOW! 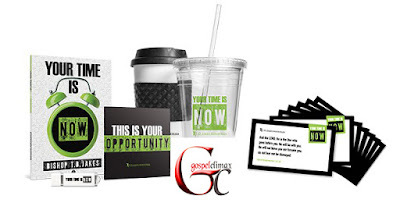 “This is Your Opportunity” message as MP3 digital download"
The Your Time is Now series, including the message “This is Your Opportunity” as MP3 digital download.